While installing or modifying programs in Windows 10/8/7, if you receive "The system administrator has set policies to prevent this installation", fix it here. 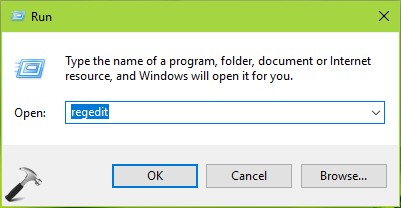 This message is from the Windows Installer feature, which has been restricted to allow program changes on your system. If you’re also victim of this problem, this fix is for you. Try the below mentioned suggestions and see if they helps you. 1. Try installing the software/program by running setup file as administrator. 2. If you don’t have administrative privileges, you can try enabling built-in admin account and then carry out the installation. 3. Make sure Windows Installer service is running in Services snap-in (run services.msc command to get this). 4. Temporarily disable the third-party antivirus you’re using, if any. 5. Temporarily disable User Account Control (UAC) and see if you can go ahead with the installation. If none of these suggestions here, try the registry manipulation mentioned below. 3. In the right pane of Installer registry key, locate DisableMSI registry DWORD (REG_DWORD) which must be having its Data set to 1. Right click on this DWORD and select Delete. Choose Yes in the confirmation prompt shown below. 5. Expand the Products registry key. Now each of sub-keys refer to particular program installation. You can verify which sub-key corresponds to which program from ProductName registry string’s Data in the right pane. Once you verified the registry sub-key for the program/product for which you’re facing this issue, you can backup the registry sub-key and then Delete it. Close the Registry Editor and reboot the machine. After restarting your system, you should be able to perform program’s installation/modification. ^^ Might be due to third-party software.